Why Bush v. Gore can’t happen again, and why that’s a bad thing. 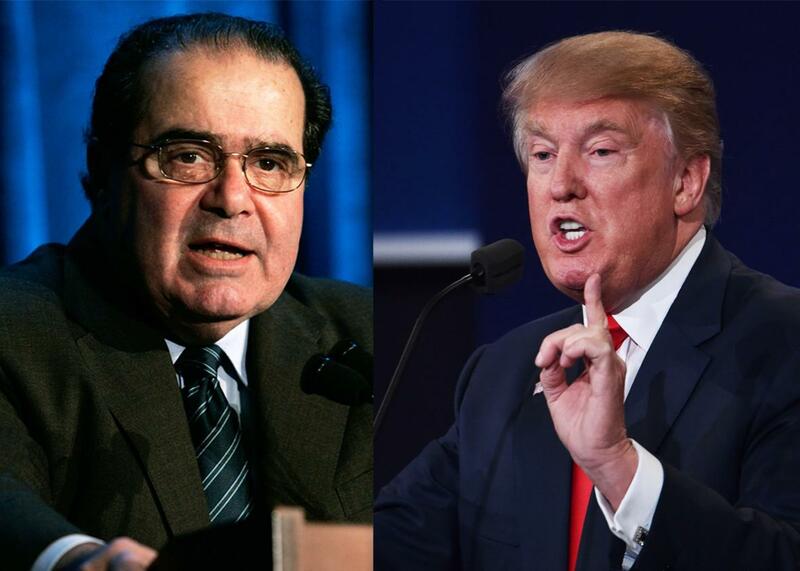 The Supreme Court will never be able to settle another presidential election. That’s a bad thing! Photo illustration by Slate. Images by Alex Wong/Getty Images and Paul J. Richards/Getty Images. The late justice’s words drove liberals nuts—it was about as dismissive as he could be without resorting to his middle finger. But as we fret about the toxic—and possibly even violent—outcome of a presidential election seen by a great swath of the electorate as illegitimate, and as we worry about the impossibility of post-election repair, Justice Scalia’s seemingly snotty answer reveals just what has been lost between 2000 and 2016. Due to unprecedented GOP delegitimizing of the court, its ability to help Americans “get over it” in another disputed election now seems to have vanished. While it won’t likely be needed in this election, with Hillary Clinton evidently poised for a landslide win, the damage to the court will have lasting effects that will result in serious damage to the republic in any future potential electoral controversy. Ironically, it’s the court that’s served as a shining example for the other two branches during this season of hyper partisanship and it’s the partisan rancor around the court this season that is damaging its legitimacy from the outside. Despite the rank injustice of how the 2000 election was decided, and the staggering silliness of the majority opinion in Bush v. Gore, Americans tolerated the judicial decree that the election was over. As Justice Stephen Breyer has suggested, we got over it because the court holds a special place in the national consciousness. As Breyer has also been quick to note, this was not always the case. Public acceptance of the court as final arbiter took centuries to earn and the justices themselves fought hard to get here. Today, thanks to Senate Majority Leader Mitch McConnell and Senate Judiciary Committee Chairman Chuck Grassley, that hard-fought public acceptance is in extreme peril. Having coughed up pretext after pretext for refusing to hold a hearing for Merrick Garland since President Obama nominated the judge to the court 223 days ago, Grassley now claims he’s withheld hearings because it’s too expensive. Senate Republicans have now clearly signaled that any nominee seated by a Democratic president will not be “their” justice and a court dominated by Democratic appointees is no longer a real court. Sorry Justice Breyer, that hard-earned appearance of legitimacy is gone. The justices, keenly aware of the problem, have worked very hard to make themselves all but invisible in recent months, even in the face of attacks by Grassley himself. With the exception of Ruth Bader Ginsburg’s July attacks on Donald Trump, the court has successfully managed to keep itself out of the partisan fray throughout this election season. To do this, the shorthanded court has had to turn away important cases and slow-walk others through the term. And through it all, the justices have largely remained silent about the frustrations of deadlock. It’s easy to argue that the refusal of the chief justice, John Roberts, to step into the political boxing ring to talk about the diminished influence of court both this term and last, is a partisan move in and of itself. But Ruth Bader Ginsburg, Elena Kagan, and Sonia Sotomayor—the three justices who have quietly criticized the gridlock—have also been at tremendous pains to praise Roberts for fostering consensus and compromise since Scalia’s death. The reason that we can continue to interact and actually like each other is because we respect each other. … We respect one fundamental truth: We know that each other has an equal amount of passion and love for the Constitution, for our system of government and for doing what’s right under the law. Even if you believe that’s just a lie justices tell themselves while flossing, never has the fiction that the court does law, not politics, been more attractive or necessary. But politics and ideology are not the only determinative factors at the court, and it’s precisely because the justices side against self-interest and personal preference, that we can tolerate the cases, like Citizens United or Bush v. Gore, in which they do. Also, as their silence in this election—even under siege—reflects, they understand the stakes. What has, over the long term, protected the court from claims of illegitimacy has been its ability to band together to put the institution before the players, because the consequences of losing the public trust are too high. That was exemplified by John Roberts voting with the liberals in the two Affordable Care Act challenges. It was exemplified by the decision to send Zubik—the contraception mandate case—back to the lower courts for a second look. This ability to play institutional possum is alternately maddening or inspiring, depending on one’s level of faith in the court. But whether it’s strategic, self-interested, or cynical, in the present election, any high official who spares a thought for the future of government institutions is a hero. It must freak the heck out of the justices when people like John McCain talk about blocking any future Hillary Clinton nominee. Or when outgoing Senate Minority Leader Harry Reid starts planning revenge against those who have blocked Judge Garland’s nomination to the court with the suggestion that Democrats should nuke the filibuster for Supreme Court nominees in the next term. But the justices just go on reading the blue briefs, and then the red briefs, and drafting their consensus opinions. Credit where it is due, if the Republic is indeed about to become a dumpster fire, the court will at least go down with its dignity. Throughout this election season I have been reminded of how different Supreme Court norms of dispassion and reason are from those of the other branches of government. You can write all that off as pointless theater, but even if it’s only for show, America could use a big dose of show-decency, now more than ever. It’s clear that the court did real and lasting damage to the country with its decision in Bush v. Gore. Whether we wanted to or not, we’ve largely recovered. It’s less clear to me that the court will get over the damage our elected officials in the Senate are doing today and the damage they will likely do in the future. And when the court lacks the legitimacy to settle the next crisis, it will be on us not them. Justice Scalia’s “get over it” was arrogant but probably necessary. The next time the court tells us to “get over it,” we need to hear them. But we probably won’t. *Correction, Oct. 26, 2016: Due to a production error, the caption on the photo with this article originally misidentified Antonin Scalia as Anthony Scalia.